Yngwie Malmsteen is a Swedish neoclassical metal musician. After tenures in the bands Steeler and Alcatrazz, he started his solo career in 1984 with the release of Rising Force, which was the name of his first band in 1978 featuring bassist Marcel Jacob and drummer Zepp Urgard. The original 1984 lineup of Malmsteen's band included vocalist Jeff Scott Soto, drummer Barriemore Barlow and keyboardist Jens Johansson, with Jacob added as the first touring bassist. The current lineup includes keyboardist Nick Marino (since 2011), bassist Ralph Ciavolino (since 2012) and drummer Brian Wilson (since 2018). Malmsteen and Ciavolino perform lead vocals. Malmsteen released his debut solo album Rising Force in 1984, which featured vocalist Jeff Scott Soto, keyboardist Jens Johansson and drummer Barriemore Barlow. Soto and Johansson remained for the next year's follow-up Marching Out, which was credited as a band effort under the name "Yngwie J. Malmsteen's Rising Force" and saw the addition of bassist Marcel Jacob and new drummer Anders Johansson (Jens's brother). Jacob was replaced on tour by Wally Voss. Soto left in 1985 and was replaced by Mark Boals, who performed on the 1986 album Trilogy but was fired by Malmsteen before its release after an altercation. Soto returned for the album's tour, after which it was reported in 1987 that Mark Weitz would perform on the next album. 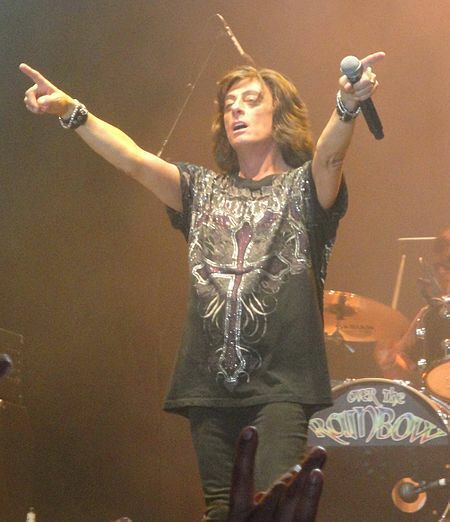 Weitz was soon replaced by Joe Lynn Turner, who performed on 1988's Odyssey. The subsequent tour spawned Malmsteen's first live album Trial by Fire: Live in Leningrad, which featured bassist Barry Dunaway. The band's lineup changed dramatically in late 1989, as Jens Johansson joined Dio and Turner joined Deep Purple. Anders Johansson also left "a few months" after his brother Jens, primarily due to frustration with the group's new management. The Rising Force group was rebuilt as an all-Swedish lineup, with new vocalist Göran Edman, bassist Svante Henryson, drummer Michael Von Knorring and keyboardist Mats Olausson, all of whom contributed to 1990's Eclipse. Von Korring left after the album's release and was replaced by Pete Barnacle on tour, before Bo Werner joined to record 1992's Fire & Ice. During 1992 and 1993, Malmsteen took a break due to the death of his manager, being dropped by Elektra Records, and his wrongful arrest. He subsequently enlisted vocalist Michael Vescera, drummer Mike Terrana and bassist Barry Sparks to join Olausson in the Rising Force band. B.J. Zampa replaced Terrana during the tour for The Seventh Sign, before Shane Gaalaas took over later in the year. Following the promotion of Magnum Opus in 1995, Malmsteen went on a temporary hiatus. He returned the following year to release Inspiration, an album of cover versions featuring several former bandmates, including vocalists Soto, Boals and Turner. Boals returned for the album's tour – which also featured Dunaway and drummer Tommy Aldridge – before Mats Levén took over at the end of 1996. Malmsteen enlisted Cozy Powell to perform drums on Facing the Animal in 1997. The drummer was also scheduled to play on the next tour, but was forced to pull out in March 1998 after suffering a foot injury in a "minor motorcycle accident". Powell later died in a car crash on April 5. He was replaced for the touring cycle by Jonas Östman. By 1999, the band included returning vocalist Boals and new drummer John Macaluso, with Alchemy released before the end of the year. Randy Coven took over from Dunaway for the album's touring cycle, although bass on 2000's War to End All Wars was performed by Malmsteen. By the time the album was released, however, Boals had left Malmsteen's band again. Jørn Lande took his place, on the recommendation of his Ark bandmate Macaluso. Lande only remained with Malmsteen until April 8, 2001, when he was involved in a backstage altercation which led to his departure. Out of "loyalty" to his Ark bandmate, Macaluso also left the band following the event. After it was initially reported that Soto would return to take over on vocals, the spot was later filled by Boals. It was also initially reported that Metal Symphony of Darkness drummer Ed Rock would replace Macaluso, although this was quickly altered to be Cherry Poppin' Daddies drummer Tim Donahue. After the conclusion of the tour, Malmsteen introduced a brand new lineup of his band: vocalist Doogie White, keyboardist Derek Sherinian, drummer Patrick Johansson and touring bassist Mick Cervino. Attack!! was recorded and released as this lineup's only album the following year. Touring for Attack!! began in December 2002 and featured Joakim Svalberg on keyboards. 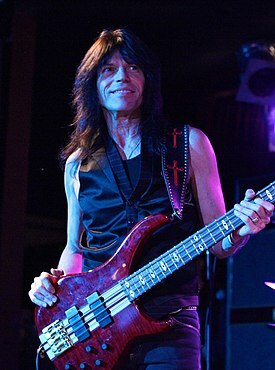 Rudy Sarzo replaced Cervino in February 2004, although by April he had left to join Dio's touring lineup. Cervino returned to the band for the tour in promotion of 2005's Unleash the Fury. 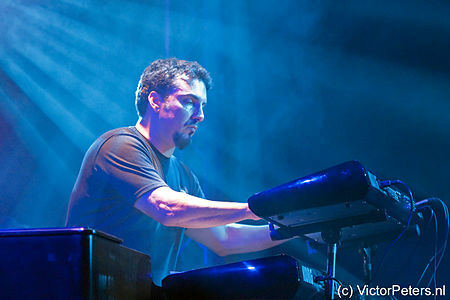 Nick Z. Marino replaced Svalberg for a run of shows later in the year, before Sherinian returned for US tour dates in 2006. In February 2008, it was announced that White had parted ways with Malmsteen due to musical differences. 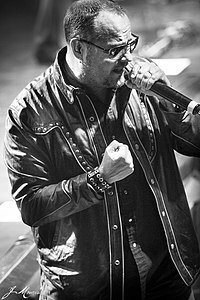 His replacement was quickly confirmed to be former Judas Priest and Iced Earth frontman Tim "Ripper" Owens. Michael Troy and Bjorn Englen were subsequently announced as the replacements for Sherinian and Cervino, respectively. Marino rejoined the band in 2009, and in 2012 Englen was replaced by Ralph Ciavolino. Leading up to the release of Spellbound, rumors began to circulate that Owens had left the band. This was later confirmed by the singer, who was not featured on the album. Owens was not replaced – Malmsteen and Marino have handled lead vocal duties since his departure. In 2015, Johansson left to join W.A.S.P. Mark Ellis took his place and performed on Malmsteen's next studio album, World on Fire. By 2018, Ellis had been replaced by Brian Wilson. ^ "Rising Force - Yngwie Malmsteen: Credits". AllMusic. Retrieved January 11, 2019. ^ Cutchin, Rusty (July 13, 1985). "Malmsteen Groundswell Pleasant Surprise This Year for Polygram" (Scan). Cash Box. Vol. 49 no. 5. New York City, New York: Cash Box Publishing. pp. 12, 38. Retrieved January 11, 2019. ^ Catania, Andrew (May 20, 2016). "Yngwie J. Malmsteen – A force to be reckoned with". Guitar Connoisseur. Retrieved January 11, 2019. ^ Rao, Deb (September 28, 2012). "Mark Boals former Yngwie Malmsteen Vocalist". Hardrock Haven. Retrieved January 11, 2019. ^ "Interview with Mark Boals". DMME.net. October 2000. Retrieved January 11, 2019. ^ Flug, Gail (May 8, 1987). "Hard Rock/Heavy Metal News" (Scan). The Hard Report. No. 27. Medford Lakes, New Jersey: The Hard Report, Inc. p. 29. Retrieved January 11, 2019. ^ Cooper, Mike (July 10, 1987). "Hard Rock/Heavy Metal News" (Scan). The Hard Report. No. 36. Medford Lakes, New Jersey: The Hard Report, Inc. p. 28. Retrieved January 11, 2019. ^ Huey, Steve. "Odyssey - Yngwie Malmsteen: Songs, Reviews, Credits". AllMusic. Retrieved January 11, 2019. ^ "Trial by Fire: Live in Leningrad - Yngwie Malmsteen: Credits". AllMusic. Retrieved January 11, 2019. ^ "Rock Over Europe" (Scan). Music & Media. Vol. 7 no. 5. London, England: European Music Report. February 3, 1990. p. 26. Retrieved January 11, 2019. ^ "FAQ". Anders Johansson. Retrieved January 11, 2019. ^ "Eclipse - Yngwie Malmsteen: Credits". AllMusic. Retrieved January 11, 2019. ^ Tengner, Andfers (2013). Yngwie J. Malmsteen - Såsom i Himmelen, Så Ock På Jorden. Bokfabriken. p. 186. ISBN 978-9187319662. Retrieved January 11, 2019. ^ Sandler, Adam (June 10, 1992). "Yngwie Malmsteen; Slik Toxik". Variety. Retrieved January 11, 2019. ^ Huey, Steve. "Yngwie Malmsteen: Biography & History". AllMusic. Retrieved January 11, 2019. ^ "Former Yngwie Malmsteeen Musicians Michael Vescera And Barry Sparks Join Forces In Riot On Mars". Blabbermouth.net. April 4, 2015. Retrieved January 11, 2019. ^ "Sho-Talk" (Scan). Gavin Report. No. 2002. San Francisco, California: United Newspapers. April 29, 1994. p. 9. Retrieved January 11, 2019. ^ "BJ Zampa (Bio)". Paiste. Retrieved January 11, 2019. ^ "Interview with Shane Gaalaas, drummer with the rock band Sign of 4 featuring UFO singer Phil Mogg". Get Ready to Rock!. Retrieved January 11, 2019. ^ "Shane Gaalaas". Pearl Drums. Retrieved January 11, 2019. ^ Huey, Steve. "Inspiration - Yngwie Malmsteen: Songs, Reviews, Credits". AllMusic. Retrieved January 11, 2019. ^ Tengner, Andfers (2013). Yngwie J. Malmsteen - Såsom i Himmelen, Så Ock På Jorden. Bokfabriken. p. 226. ISBN 978-9187319662. Retrieved January 11, 2019. ^ "Facing the Animal - Yngwie Malmsteen: Credits". AllMusic. Retrieved January 11, 2019. ^ Siegler, Joe (March 23, 1998). "Cozy Powell Pulls Out Of Malmsteen Tour". Black Sabbath Online. Retrieved January 11, 2019. ^ Layne, Anni (April 8, 1998). "Cozy Powell Dies In Car Crash". Rolling Stone. Retrieved January 11, 2019. ^ Tengner, Andfers (2013). Yngwie J. Malmsteen - Såsom i Himmelen, Så Ock På Jorden. Bokfabriken. p. 232. ISBN 978-9187319662. Retrieved January 11, 2019. ^ "June 24 - 30: This Week In..." Brave Words & Bloody Knuckles. June 25, 2001. Retrieved January 11, 2019. ^ "Ex-Yngwie Malmsteen, TNT Drummer John Macaluso Shares His Experience And Knowledge (Video)". Blabbermouth.net. November 6, 2011. Retrieved January 11, 2019. ^ Huey, Steve. "Alchemy - Yngwie J. Malmsteen's Rising Force: Songs, Reviews, Credits". AllMusic. Retrieved January 11, 2019. ^ Prato, Greg. "Randy Coven: Biography & History". AllMusic. Retrieved January 11, 2019. ^ "War to End All Wars - Yngwie J. Malmsteen's Rising Force: Credits". AllMusic. Retrieved January 11, 2019. ^ "October 28 - November 3: This Day In..." Brave Words & Bloody Knuckles. November 4, 2001. Retrieved January 11, 2019. ^ a b "Archive News Apr 11, 2001 - update 1". Blabbermouth.net. April 11, 2001. Retrieved January 11, 2019. ^ "Archive News Apr 13, 2001 - update 2". Blabbermouth.net. April 13, 2001. Retrieved January 11, 2019. ^ "Archive News Apr 27, 2001". Blabbermouth.net. April 27, 2001. Retrieved January 11, 2019. ^ "Yngwie Malmsteen Departed Singer And Drummer Respond!". Brave Words & Bloody Knuckles. April 25, 2001. Retrieved January 11, 2019. ^ "Archive News Apr 30, 2001". Blabbermouth.net. April 30, 2001. Retrieved January 11, 2019. ^ "Archive News Aug 22, 2001". Blabbermouth.net. August 22, 2001. Retrieved January 11, 2019. ^ Monger, James Christopher. "Attack!! - Yngwie J. Malmsteen's Rising Force: Songs, Reviews, Credits". AllMusic. Retrieved January 11, 2019. ^ "Yngwie Malmsteen Announces Florida Dates". Blabbermouth.net. November 18, 2002. Retrieved January 11, 2019. ^ "Rudy Sarzo Joins Yngwie Malmsteen's Touring Band". Blabbermouth.net. February 12, 2004. Retrieved January 11, 2019. ^ "Bassist Rudy Sarzo Joins Dio". Blabbermouth.net. April 23, 2004. Retrieved January 11, 2019. ^ "Yngwie Malmsteen: Touring Lineup Announced". Blabbermouth.net. May 12, 2005. Retrieved January 11, 2019. ^ a b "Nick Z Marino". Yamaha Corporation. Retrieved January 11, 2019. ^ "Yngwie Malmsteen: Keyboardist Derek Sherinian Rejoins Touring Band". Blabbermouth.net. April 21, 2006. Retrieved January 11, 2019. ^ "Yngwie Malmsteen Parts Ways With Doogie White; Tim 'Ripper' Owens To Step In?". Blabbermouth.net. February 26, 2008. Retrieved January 11, 2019. ^ "It's Official: Tim 'Ripper' Owens Is The New Yngwie Malmsteen Singer". Blabbermouth.net. February 26, 2008. Retrieved January 11, 2019. ^ "Yngwie Malmsteen: Complete New Lineup Announced". Blabbermouth.net. February 27, 2008. Retrieved January 11, 2019. ^ "Tim 'Ripper' Owens Does Not Appear On New Yngwie Malmsteen Album". Blabbermouth.net. October 18, 2012. Retrieved January 11, 2019. ^ "'Just wish he had good things to say when Ronnie was alive': Tim Owens rips into Vivian Campbell's Dio project". Something Else Reviews. October 28, 2012. Retrieved January 11, 2019. ^ a b Anton, Ray. "Yngwie Malmsteen: Parker Playhouse". SFL Music Magazine. Retrieved January 11, 2019. ^ "W.A.S.P. Recruits Yngwie Malmsteen Drummer Patrick Johansson". Blabbermouth.net. July 19, 2015. Retrieved January 11, 2019. ^ "Yngwie Malmsteen - World On Fire Album Due On June 1st; Artwork, Tracklisting Revealed". Brave Words & Bloody Knuckles. May 18, 2016. Retrieved January 11, 2019.